Announced this morning are the two “special guests” promised for the Tool show in San Bernadino this June. They are Fantômas and Clutch, who are both great additions to the lineup! Anyway, this sounds like a great show. Wish I could be there, but seems unlikely to happen! Looking forward to hearing reports from all Fourtheye readers who attend! 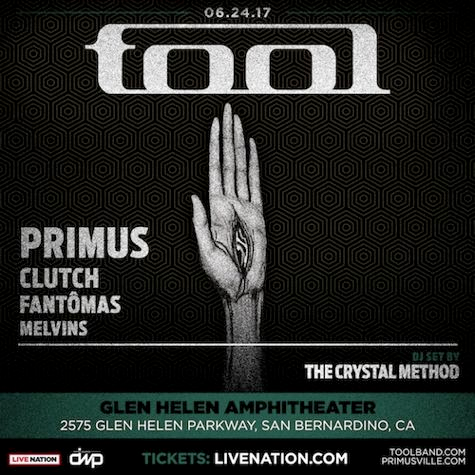 “Clutch and Fantômas–in a very rare live performance–will join iconic band TOOL along with PRIMUS, MELVINS, and DJ sets by THE CRYSTAL METHOD at Glen Helen Amphitheater in Southern California on Saturday, June 24, 2017. Tickets for the show–which is produced by Danny Wimmer Presents and Live Nation Los Angeles-are on sale now at www.Ticketmaster.com. Interestingly this doesn’t line up with the band reportedly mentioned by Danny at the Baked Potato recently. That band was Killing Joke, who are in fact on tour in Europe while this show goes ahead. Miscommunication perhaps, or just a killer joke? Looks like Ipecac Recordings have opened an online store to sell stuff for their more popular bands. You can find a wide selection of shirts and stuff from all your favorites, including Tool tour mates Tomahawk, Fantomas, Isis and The Melvins. Some cool stuff there. One thing you can purchase is this cool Melvins Doll. it could be yours for US$50! This Friday the 27th of July, the Melvins will be playing at The Troubadour in Hollywood. Trevor Dunn from Fantomas will be taking care of bass playing this show, and they’re expecting to play the entire Lysol and Eggnog albums. Blair tells us that some members of Tool might be there. Adam playing with the guys perhaps? Poll Results: Favorite Mike Patton Project? Last weeks poll asked what was your favorite Mike Patton project? Personally I’m a Tomahawk fan, but it came as no surprise to me to see that Faith No More won the poll. Faith No More were pretty much a defining band for me as a teenager. Without them, and particularly Angel Dust I probably would never got into Heavy Music at all, and would be stuck in the purgatory of Def Leppard and Bon Jovi. Still, my love of The Jesus Lizard and Helmet make me love Tomahawk in a way only rivalled by Tool. In reality tough, there are few Mike Patton projects I don’t like. I’ve seen Mr Bungle live twice, and both times would be in my top 10 of live shows ever, especially the show from the California tour. Various Solo Albums No Votes! For the first time ever, one of the items received no votes! I really didn’t thing the Mike Patton Solo stuff was that bad! This week the poll asks what Tool item you would rather see in your Xmas stocking on Monday morning. Vote away! !